The GDL 88 is the first dual-link solution for certified aircraft that not only provides a path to ADS-B “Out” compliance for many pilots, but also brings subscription-free weather and advanced traffic display to the cockpit. Under the NextGen air traffic management system, all aircraft in controlled airspace will need to be equipped with ADS-B “Out” technology by 2020. For those who only fly below Class A airspace (18,000 ft) and in U.S. skies, the GDL 88 offers an affordable solution to reaching compliance. And even if you fly above 18,000 ft, the GDL 88 can still give you all the benefits of ADS-B “In” data – consider pairing it with a GTX 330/33 ES transponder for a comprehensive ADS-B “In/Out” solution. With ADS-B “Out”, the GDL 88 gathers information about your position, track and ground speed from either your existing WAAS GPS source or an optional built-in WAAS receiver. It then broadcasts this information to ADS-B ground stations over the 978 MHz Universal Access Transceiver (UAT) frequencies. This gives ATC and ADS-B “In” equipped aircraft a more precise picture of what’s happening in the sky, and allows for more safe and efficient flight routing. The GDL 88 also features ADS-B “In” datalink technology that allows it to receive subscription-free Flight Information Service-Broadcast (FIS-B) weather broadcast from ADS-B ground stations on this same 978 UAT frequency. On a compatible flight display, this uplink allows you to view graphical NEXRAD radar, METARs, TAFs, SIGMETs, AIRMETs, NOTAMs, TFRs and more. The GDL 88 can receive ADS-B position reports directly from other aircraft in your vicinity. Because the FAA permits ADS-B broadcasts on 2 frequencies (978 UAT and 1090 ES), the GDL 88 contains both receivers so you can see a comprehensive view of all ADS-B “Out” equipped targets. ADS-B provides the ability to provide air-to-air datalinks with other aircraft. The GDL 88 is compatible with active traffic systems and prioritizes multiple traffic inputs, removing duplicate targets by choosing the highest integrity source available. ADS-B “In” technology also allows the GDL 88 to receive Traffic Information Service-Broadcast (TIS-B) information. On a compatible display, TIS-B allows you to view the same dynamic traffic picture that ATC ground controllers are seeing. TargetTrend™ technology (available on compatible displays) provides an easy-to-interpret picture of aircraft trajectories. When receiving ADS-B traffic information, this allows you to better predict potential conflicts. SURF technology also supports the display of ADS-B-equipped surface targets on Garmin SafeTaxi® airport diagrams – including taxiing aircraft and ground vehicles. 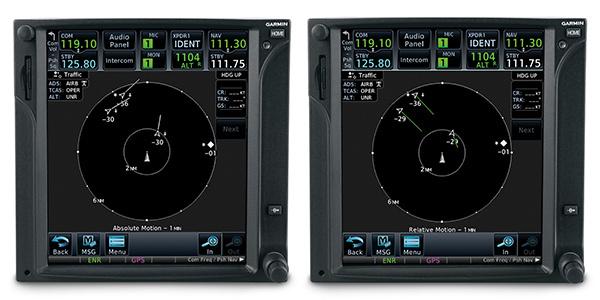 The advanced display capability of the GTN series avionics allows for enhanced functionality with the GDL 88. When there are several traffic targets in an area, the GTN will declutter the display by grouping the targets and showing only the one that is the highest priority. The pilot can touch a grouped target to ungroup and show all targets in the area. The GTN also allows the pilot to select any target on the display to view more detailed information including closure rate and ground speed. You can still take advantage of the GDL 88’s ADS-B “In” traffic, even if you don’t have a compatible flight display to view the data. When installed in an aircraft without a compatible display, a visual indicator light can alert you when traffic enters your vicinity. Audible alerts tell of a target’s range, bearing and relative altitude (when available). You’ll hear this information through your cabin audio system in an ATC-like spoken format. For example, you might hear, “Traffic: 10 O’Clock, High or Low or Same Altitude, 2 miles.” In most cases, installing a GDL 88 with WAAS can provide a complete solution for ADS-B “Out” while still allowing you to receive some ADS-B “In” benefit — all with a single product. ADS-B requires your ADS-B “Out” source must squawk the same code as your transponder. Patent-pending technology allows the GDL 88 to be compatible with a wide range of general aviation transponders — synchronizing squawk code and ident to eliminate the need to install a dedicated UAT control panel. Available antenna options allow the performance of the GDL 88 to be optimized for any type of aircraft. For optimal performance, a diversity antenna version with both top- and bottom-mounted antennas enhance the detection of traffic both above and below, and works to minimize radio blind spots caused by the wings or fuselage during aircraft maneuvering. This is especially useful in maintaining optimal reception of ADS-B weather and traffic during ground operations. A basic bottom-mount antenna version is also available as a more cost-effective alternative.